Rachel Von | The Journal Gazette Adams Central's Kevin Brown, who led all scorers with 30, tries to get around Jay County's Michael Schlechty. After Jay County won the overtime tip on Tuesday night, Adams Central coach Aaron McClure was worried the Flying Jets would never get the ball, or a chance to win the first-round of the boys ACAC Tournament. The Patriots (7-5) had battled back from a nine-point halftime deficit, forced the extra session with a last-minute tip-in by Michael Schlechty and then held the ball for the first half of the four-minute overtime period. Adams Central (6-5) regained possession only with a steal by Lucas Van De Weg. The Jets did not make a field goal during overtime but made 10 of 14 from the foul line to win 51-45. 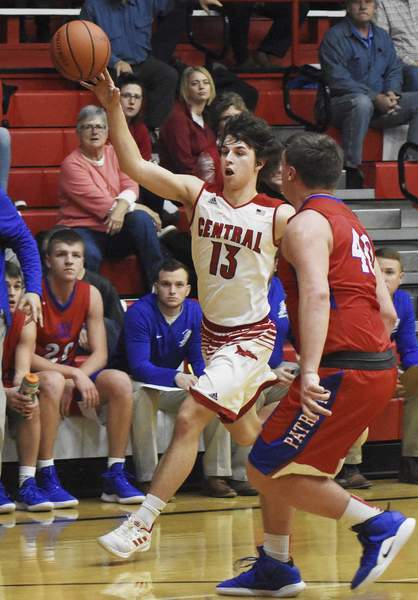 It was quite a turnaround for Adams Central, which had just lost by 21 to the same Jay County team Saturday. The Jets will now face Bluffton in the semifinal at 6 p.m. Friday. That situation could have repeated itself Tuesday at Adams Central. The Patriots jumped out to a 7-0 lead in the first five minutes. At that point, McClure called a timeout and, a minute later, the Jets had cut the lead to 7-6. By the end of the quarter, Adams Central led 11-9. Adams Central's fortunes changed as Kevin Brown, who missed his first three shots of the game, started heating up. He scored eight points in the final three minutes of the quarter and had 18 by halftime. He finished with 30. “At some point in a game like this, you need your best player to step up and make plays, and he did that,” McClure said of Brown. Van De Weg scored nine points for the Jets, while 6-foot-8 senior Dylan Miller had 14 rebounds. Miller also had a key layup with just over a minute to go in the third quarter that ended a 7-0 run by the Patriots. Michael Schlechty scored a team-high 14 points and had 11 rebounds for Jay County. Six of those points came during the Patriots' fourth-quarter comeback. Ryan Schlechty and Matt Franks each hit 3-pointers in the final stretch to help force overtime. But for now, at least, the Jets remain in the running to claim their first ACAC tournament title since 1976. “The game's the same, we just had to play better than we did the other night,” McClure said. “Obviously, if we win, we're playing Bluffton on Friday night, and if we lose, we're playing in the consolation game. In the course of the game, you probably don't take the time to think about that. But certainly it was a big win, because now we advance in the tournament.